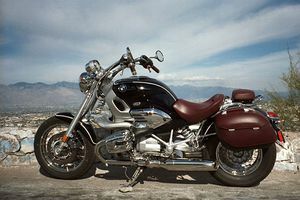 Cruiser is the term for motorcycles that mimic the design style of American machines from the 1930s to the early 1960s, including those made by Harley-Davidson, Indian, Excelsior and Henderson. The market for models evocative of the early cruisers has grown to embrace 60% of the US market, such that all major motorcycle manufacturers -- from Honda to Suzuki, from Moto Guzzi to BMW motorcycles have currently or have had important models evocative of the American cruiser. The riding position on a cruiser places the feet forward and the hands up, with the spine erect or leaning back slightly, which many find to be more comfortable for long-distance riding. The "Western Saddle" riding position of American style Cruisers and Choppers evolved from the saddle and riding position used by cowboys in the American West. This position allows greater long-distance comfort, albeit with some compromise of control. Most Chopper-style motorcycles would also be categorized as a type of cruiser. Many cruising motorcycles may have limited performance and turning ability due to a low-slung design. Riders who enjoy cornering at higher speeds may need to customize to enhance lean angle, or start with a performance or sport-cruiser. Cruisers are often custom projects that result in a bike modified to suit the owner's ideals, and as such are a source of pride and accomplishment. Cruisers are sometimes called "custom motorcycles" even in the absence of aftermarket modifications. This page was last edited on 13 March 2008, at 13:21.